For both of these photos I was in front of the front row of this venue i.e. 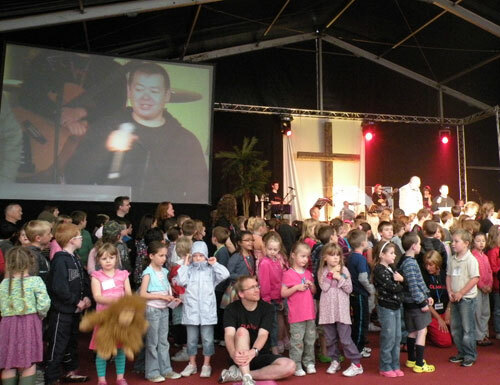 between the front row and the stage – but way off to one side (as mentioned in previous posts I was involved in the children’s programme at this event and this is the day that the children come in for the parents to hear what we have been doing all week). 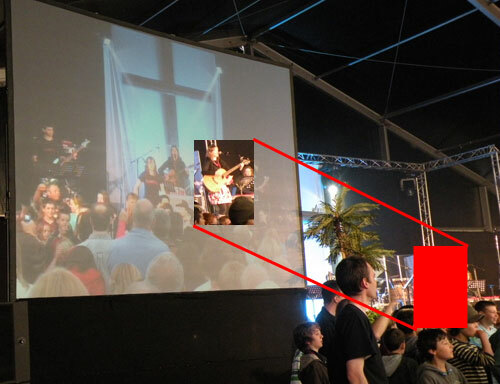 This photo shows that Jenny (who is leading the worship) is the same size (actually a little smaller) on the screen as she appears in perspective looking at the stage. So what is this image on large screens either side of stage adding? I’m not saying that live cameras shouldn’t be used. They are very good for magnification of the speaker – as mentioned before. But [I think] there should never be a medium or wide shot which visually doesn’t add anything. The other problem is that because events have live cameras they end up using them during worship which totally baffles me. Why do you need a close up of the worship leader singing, or a guitarist, drummer, keyboard player, etc.? I don’t get it. 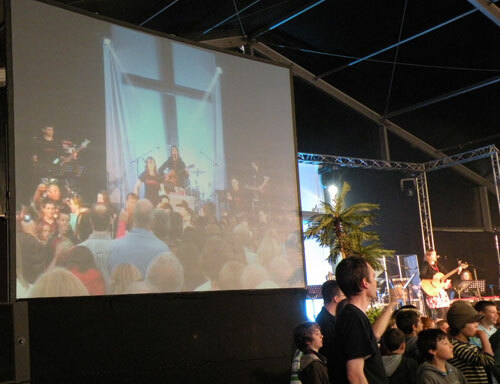 Obviously, given this blog, I am very much in favour of visuals during worship but generally speaking I wouldn’t include live camera in that – there have been a few occasions I have used live camera but very very occasionally and thinking back on those events I don’t actually think they worked that well. 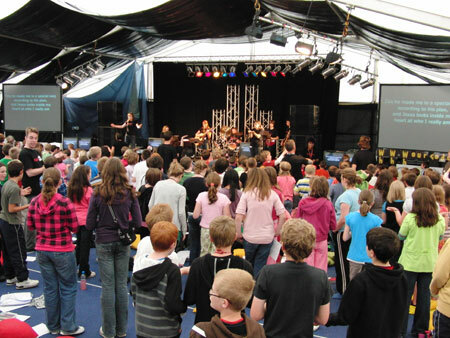 OK, so ‘rant’ over – if you are involved in this sort of event and find yourself projecting live video of the band please question why and if something else might be more suitable. This video is a live performance at Cathedral of Breda, NL with original music by Thomas Vaquié, played on organ by Gerard Maters with light design by Giacinto Caponio, Grote Kerk is a sublime modern, digital spectacle, a light and sound show all performed live using software from arKaos. I had always planned to use this blog for a mix of “How to..” guides and some of the spiritual Christian aspects of using visual media in a worship context. Of course the practical stuff is not only easier to write about than the spiritual side, but this week I have a good example which should illustrate how I find video mixing a spiritual experience. 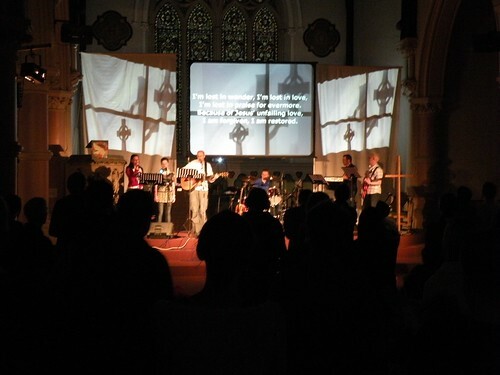 So this month’s Deeper service at St Silas had a set up of three projectors all taking the same signal from a Mac Book Pro running ArKaos Grand VJ software – with the middle screen also having song words keyed over when needed. We kept the set up fairly simple in that it was a straight forward 800×600 screen size. Two of the eight available layers had a chroma key type mix, the others were just opacity mixes. The first part of the service was more or less a scripted running order with mostly specific videos to appear on queue for the talk etc. but once it gets to the sung worship time the song words are provided by another operator and I have no script to follow for what visuals appear on screen, when to change them, how to pace it, etc. So the way the set developed seemed to be working well. I started off with mainly abstract & conputer generated graphics which fitted the tempo but not generally trying to say anything. Then through “It’s our confession” I added in some stills of hands tied together being opened up, and gradually added more footage of a celtic cross, then flames, etc. frequently coming back to the CG abstract stuff to weave that through as a sort of theme. So, what I’m trying to say is – pray before hand, be prepared and pray during. I now have a large and constantly growing ‘pallet’ of video footage to draw on and try to listen for insperation. Sometimes I come away thinking or feeling as if I’ve done it all with my own effort, and sometimes I have no idea why I decided to use a certain type of image (like the water ones) and they fit exactly with what God is doing. This leaves us wuth a fine line between preparing well (i.e. having the footage available and knowing it well) and not over preparing (i.e. scripting what image to use with each song) – so that God has space to do his own stuff through what you are doing. (1) if the problems with the graphics card/processor computing the image can be resolved by reducing the complexity of the output, i.e. the number of visible layers, resolution of footage, effects being applied, etc. (2) if the problem is pulling video from HDD and decompressing, there isn’t much you can do ‘on-the-fly’ but when you have time try the same setup with the same footage pulled from another location to confirm the problem is HDD access or decompressing. If it is HDD find a better solution, if the problem is decompressing converting the footage to a better format/codex should help. As mentioned in previous ‘how to’ post, at St Silas we have set up this large Labyrinth for the past 4 or 5 years as a Good Friday ‘journey’ come ‘meditation’ and it has been well received. People find it a useful way to take some time out before the holiday weekend to think about the impact and implications of Jesus death before we go on to celebrate the resurrection on Easter Sunday. There are many ways to make a Labyrinth, but as I’ve not come across many groups that use all the elements we do I thought it worth laying out some of the choices we have made in making this happen. I’m not trying to say this is the only or best way to do this sort of thing, just what we find works and I welcome comments. Firstly the physical environment. As described in the previous post we ceate ‘walls’ which are taller than head height. The start of the walk uses black fabric and later this changes to white. Around most corners is an installation or ‘station’, these vary from simply a sign to play a given mp3 track at this point to videos to watch, and physical props to interact with. The ‘walls’ as well as the lighting, use of personal mp3 players, etc. are designed to give an environment where each person is isolated from distractions and can emerse themselves in the experience as much as possible. Audio: MP3 tracks, as mentioned the use of headphones/ear buds helps to isolate the user of the labyrinth and help the immersiveness of the experience. The tracks themselves have been created specially for the labyrinth by mixing music with readings and instructions. The pace is carefully planned and the end of each track has been extended following feedback in the first couple of years so that people can remain at any station for longer than instructed and press ‘next’ when they are ready to continue. Each year we have changed elements of the labyrinth and so each year some of these tracks have been remixed. We also make sure we have some printed transcripts of the audio for any visitors with hearing difficulties. Also, worth mentioning that even though people have personal headphones on they will still hear ambient sound from outside the labyrinth. As we offer tea & coffee at the end of the labyrinth and with team members chatting, handing out players, people coming in and out, etc. we simply can’t keep the place silent. We have tried to address this by playing music as ‘audio camouflage’ and have found that classical music is best, especially nothing with a strong beat. Installations, most of the ‘stations’ have something to watch, look at or interact with in a variety of ways. Many of these involve simply watching a video loop most of which were specially made and designed to have no (or little) narrative. This means that people could begin to view the video at any point in the video without necessarily loosing any of the impact. One, however was effectively a slide show of stills mixed with words from a poem, which is a lot harder to loop and some people did report that this station didn’t work for them. We also used two still images, a drawing of Jesus stripped naked and a photograph representing Jesus falling. – the first has a large piece of wood that represents the cross piece of the cross of Christ and the audio track asks people to think about the cross being given to Jesus to carry and invites them to pick it up to feel the weight. However, very few people tend to do this, I think because it is fairly early on in the labyrinth and people are still finding their way. 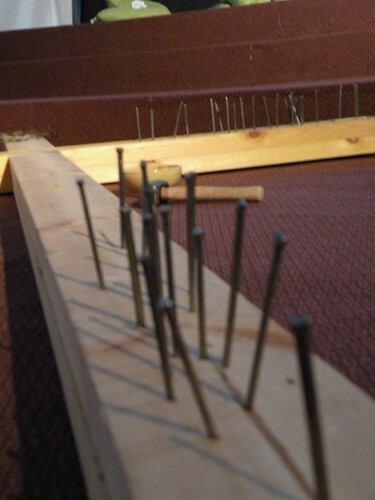 – the next example is new this year, where we had a very large cross built and the instruction was much more direct as people were to hammer a nail into the cross representing their individual part in Christ having to be put on the cross. – lastly, is a bit more subtle. After listening to the track and watching a video people walk through the screen on which the video is being projected. By doing that they become part of the image and go through the cross in a physical as well as spiritual way. I’m not sure how many people notice or get that bit, but it is deliberate. Multi-Sensory, already mentioned is the use of sight, sound and touch, we also use flowers and strong smelling oils at different stations but as yet haven’t found a way to introduce taste (other than hot cross buns with your coffee at the end). Accessibility, we have given some thought to this, insofar as we provide a printed alternative to the audio and while a great deal of the labyrinth is visual we think that nothing is missed if only the audio was available. We could also open up an alternative route for wheelchair users if need be because one part of the labyrinth goes on and off our stage. The main reason for this blog is to demonstrate and discuss the use of visuals in worship, but the thing to learn from a labyrinth is that video could be used as a stand alone station – run a video on a plasma screen near the entrance or in a quiet corner for meditation, etc. Video/visuals within worship doesn’t have to be choosing what image or video to put behind words. 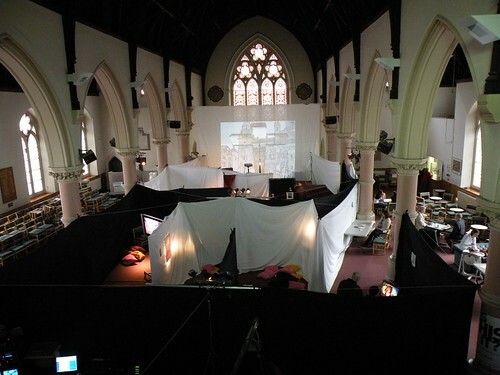 As I’ve mentioned previously it could be visuals projected elsewhere on the building or during different parts of the service / meeting / event, not just singing or to transition between parts of the service.